There are a few ways to get streaming access to Showtime's content on your Android devices, but now it's more than just streaming. The network has announced that users of the Showtime standalone streaming service and Showtime Anytime can now download content to watch offline. The new download functionality is available in the Showtime and Showtime Anytime apps via an update in the Play Store. This appears to be live today, so subscribers can start downloading now (also on APK Mirror). To download content, just look for the "Download" button on the details page. On phones, you can choose between 540p and 720p. The 1080p download option is only available on tablets, though. This follows a similar move by Netflix a few months ago, which was more exciting than this. Sorry, Showtime—that's just how it is. While Showtime doesn't have as much content as Netflix, there should be fewer blackouts. Still plenty of reason to be jazzed if you're a subscriber. NEW YORK – April 6, 2017 – For the first time, Showtime Networks is offering subscribers to the SHOWTIME stand-alone streaming service and SHOWTIME ANYTIME the ability to download programming on mobile devices and tablets – allowing viewers to watch content offline at no extra cost. The entire SHOWTIME library of programming, featuring the network’s award-winning original series, hit movies, provocative documentaries, hard-hitting sports programming and comedy specials, is now available for download on iOS devices (iPhone and iPad), Android phones and tablets, and Amazon Fire Tablets. This includes full seasons of HOMELAND, BILLIONS, RAY DONOVAN, SHAMELESS, THE AFFAIR, WEEDS, DEXTER® and more. SHOWTIME downloads are easy to use. 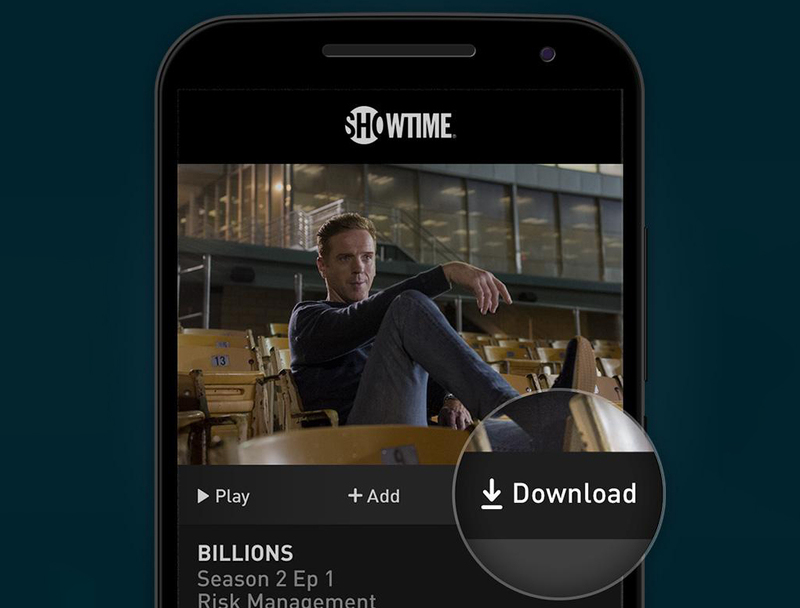 After updating the SHOWTIME and SHOWTIME ANYTIME mobile applications, subscribers can download a program by simply tapping on the “Download” button on the program’s detail page. Users on phones will see a prompt to select a video quality option, either standard definition (540p) or high definition (720p). Tablet users will have the additional option for the highest definition (1080p). Viewers can start watching a program before it has finished downloading. And, if viewers start streaming a show and then want to finish watching on the go, the download will pick up right where users left off. Downloads are always easily accessible by tapping on the “Download List” icon in the top navigation bar. SHOWTIME is currently available to subscribers via cable, DBS and telco providers, and as a stand-alone streaming service through Apple®, Roku®, Amazon, Google and Samsung atwww.showtime.com/samsung. Consumers can also subscribe to SHOWTIME via Hulu, YouTube TV, Sling TV, Sony PlayStation® Vue and Amazon Channels. The network’s authentication service, Showtime Anytime, is available at no additional cost to SHOWTIME customers who subscribe to the network through participating providers. Subscribers can also watch on their computers at www.showtime.com and www.showtimeanytime.com.